At a time when I taught piano in a prep school, I noticed that some pupils were making better progress than others. Rose, for instance, was forging ahead and even learning a new piece all on her own every week, as a surprise for me at the next lesson. Tom, on the other hand, seemed to enjoy his lessons and appeared to be capable but was making very slow progress. When I did some research into my students' practice habits I discovered that whilst Rose's mum sat with her most days when she practised, Tom's parents had not realised that he was supposed to practise! Children who boarded at that school had strictly allocated and supervised practice time, so I had wrongly imagined that information on the importance of practice would have been sent to parents of children who lived at home. Needless to say, Tom's achievement and motivation levels were low. Once I'd got in touch with Tom's parents and they had realised he was supposed to practise, they began supporting him, and Tom's engagement and progress increased dramatically. Even better, when they spent time with Tom as he practised his enthusiasm for playing rocketed so everyone was happier. What are parents supposed to do at practice time? The answer is - it depends ... Broadly speaking, the younger the child, the more beneficial it will be for the parent to be there, supporting and being interested in practice. Research by Zdinski (1), suggested that, in a two-parent family, both parents have an important role to play - mum's presence seems to promote affective learning (to do with feelings, values and attitudes) whereas dad's support tends to influence learning, knowing and performing outcomes. Not every child has a two-parent family, of course; the really important principles are knowing your own child, realising that you make a difference and supporting her practice time in whatever way is best for your family. Older girls, in particular, can become sensitive about being listened to and may prefer to practise in private. This feeling is entirely reasonable and may be regarded as a welcome sign of your daughter's growing maturity rather than a wish to exclude you. Professional musicians generally prefer to practise in private too. 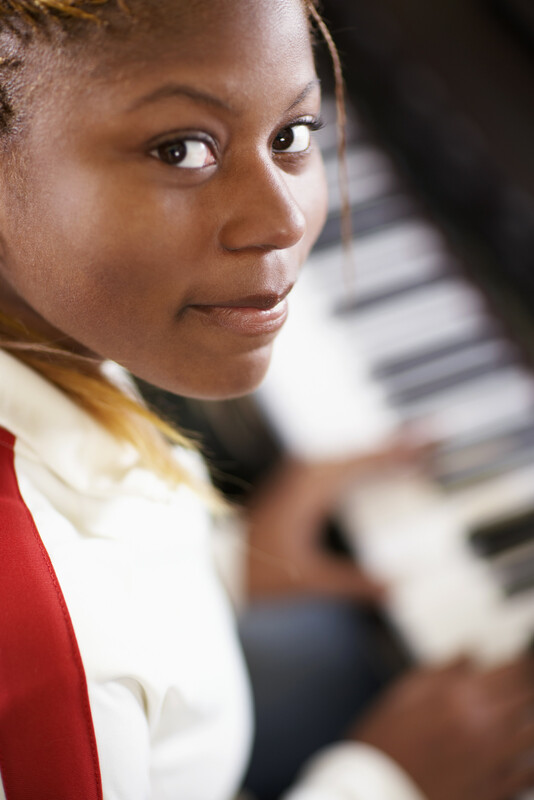 Many teenagers are perfectly capable of following their teacher's guidance and, once they are becoming more advanced as a musician, both they and the teacher could construe overt parental involvement as interference. Unless you have good reason to believe your teenager is not actually practising at all, it's best to be sensitive to her changing preferences and growing need for independence and responsibility. You could certainly say that you'd love to listen now and then as a supportive audience and that you are happy to help in any way you can if your opinion is sought. You may find it easier to know what your child's playing is supposed to sound like if you sit in on at least some of the lessons but, whereas many children respond well to this, others learn and concentrate better if the parent is not there. Again the younger the child, the more useful it is for a parent to sit in. Many teachers are happy for you and your child to decide whether or not you are going to be there at lesson time; indeed, in the light of recent child protection concerns, teachers who work from home are perfectly justified in asking parents to be present at private lessons. A good solution that covers all bases could be for you to wait in an adjoining room with the door ajar. If you do not sit in on lessons, or if your child learns at school, you will probably find that the teacher writes practice guidance in a special, music lesson notebook so that both you and your child can refer to it during the week. The notebook can be a friendly means of communication between you and the teacher, so it can be helpful if you write in it too, for example to highlight what your child especially enjoyed practising as well as to mention any special efforts or difficulties encountered along the way. Let's remember how helpful grandparents, aunties, uncles and older siblings can be in respect of providing support for practice and acting as an appreciative audience (not to mention helping out with ferrying children to their lessons!). On the other hand, younger siblings can interfere with practice and even disrupt lessons. If you take younger children along to your child's lesson, do take suitable activities to occupy them quietly and, if possible, wait in an adjoining room so as not to disturb the lesson. Impress on your child's younger sisters and brothers how important it is to respect practice time too; this will be beneficial for all concerned in raising the profile of music in your family.